Located in Stony Plain, AB. Dr. Aluko is a certified Family Physician with the College of Family Physicians of Canada. Dr. Aluko is a Family Physician with 20 years of experience who has always had a passion for women’s wellness and is one of the founding physicians of The Women’s Clinic at The Westview Primary Care Network since 2006. She is a member of the North America Menopause Society. Dr. Aluko’s dedication to ensuring accessible solutions for women suffering from Vaginal Atrophy has awarded her the privilege to be one of the first doctors in Western Canada to offer the MonaLisa Touch®. Providing cutting edge treatment for women who choose not to or cannot take hormone therapy as well as offering effective care for urogenital atrophy and stress incontinence caused by natural, surgical or chemotherapy-induced menopause. Dr. Aluko is excited to offer this functional procedure, The MonaLisa Touch®. Main Street Medical Clinic is accredited with commendation by Accreditation Canada. It is a team based patient medical home. Dr. Aluko is a certified Family Physician with the College of Family Physicians of Canada, a Fellow of the College of Family Practitioners of South Africa. She is a licentiate of the Medical Council of Canada. Her Master of Medicine with a specialization in Family Medicine was obtained through the University of Pretoria, South Africa. 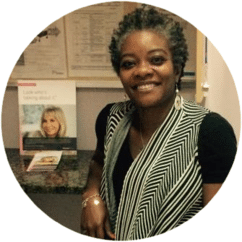 She is presently a member of the North America Menopause Society(NAMS) and through the resources provided by NAMS, Dr. Aluko is continually updating her knowledge and education on scientifically proven managements of menopause and associated symptoms and new cutting edge treatments. With over 20 years of Family Medicine Practice, her passion for women’s health and her dedication to helping women with the management of their peri and post menopausal symptoms has brought Mona Lisa Touch into her practice. As an experienced family physician, she does all in-office gynaecological procedures and has had experience in some minor and major gynaecological and obstetrical surgeries.